Name a Jewish holiday, and there’s usually a special food associated with it. That’s certainly the case with Purim, which is coming up this weekend. I made gluten-free, dairy-free hamantaschen — triangular, jelly-filled cookies — using the recipe I posted last year. I found the recipe so easy to work with last year, but a bit more difficult to cut out the circles this year. It helped when I chilled the dough in the freezer then liberally sprinkled rice flour on the wax paper when I was rolling out the dough. Go figure. There is so much that goes into baking — the smallest changes in ingredients, temperature, etc., end up making a big difference. 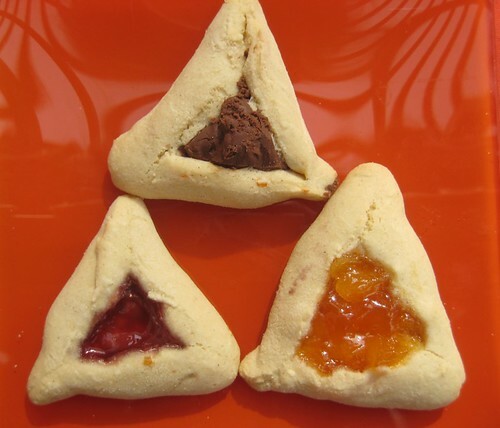 My kids love shaping the hamantaschen and doing a “magic” trick: taking the circles of dough and turning them into triangular cookies. They also love thinking of crazy fillings to put in the hamantaschen. This year we tried marshmallows, white chocolate chips, Nutella and mint M&Ms, along with apricot and raspberry jam. I actually like the traditional prune and poppy seed fillings, but I did not have the ingredients on hand. Check out this cute, short video of my older daughter shaping hamantaschen, and turning circles into triangles. Yes, she really does say to “gently, carefully, tenderly” fold up the dough! 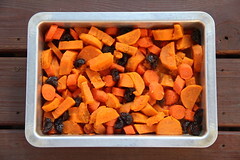 The full recipe is posted here. Purim is a joyous Jewish holiday in which we celebrate how Queen Esther helped outsmart and thwart the evil Haman, who had plotted to destroy all the Jews in ancient Shushan (in Prussia). We celebrate by reading the Megillah (Scroll of Esther) and drowning out Haman’s name with noisemakers. We also dress in costumes, play games at Purim carnivals and eat hamantaschen, which are triangular fruit-filled cookies shaped like Haman’s tri-cornered hat. In past years, I’ve struggled with making gluten-free hamantaschen. One year I had so many failed batches that I laid down and cried. 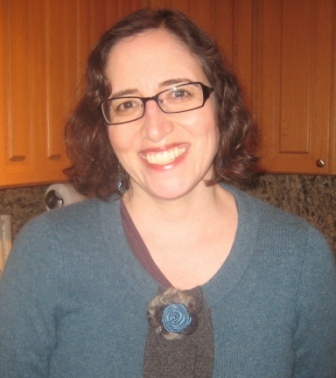 This year, I once again set out to make gluten-free hamantaschen for Purim, so my daughter could have treats to bring to her class parties and family celebrations. I originally wanted the recipe to include ancient gluten-free grains like quinoa, amaranth and buckwheat, because they have significantly more protein and fiber than standard gluten-free flours. But no go. The taste was too strong and color too dark. That was two batches down, plus one batch that ended up on the kitchen floor when the parchment paper slid off the cookie sheet. D’oh. I’m glad I kept trying. The dairy-free version below has a delicate taste without a gluten-free grittiness. 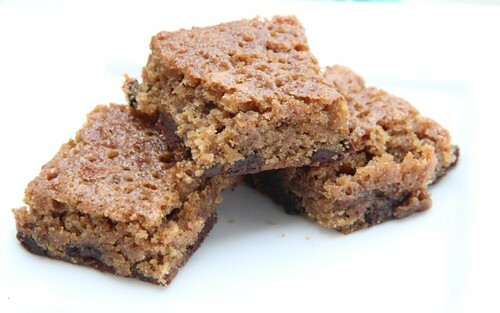 The brown rice flour and sorghum subtly add extra protein and fiber, and the fruit filling provides the perfect sweetness. If you’re unfamiliar with hamantaschen, they are somewhat similar to the Central European kolache (or is it kolachki? ), in that they are cookies with fruit centers. 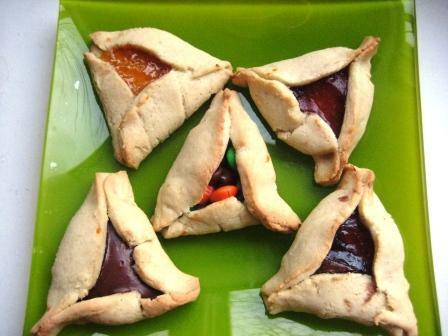 Traditional hamantaschen fillings are prune, poppyseed and apricot, but you can fill them with anything, including any kind of fruit preserves, chocolate chips, M&Ms or Nutella. 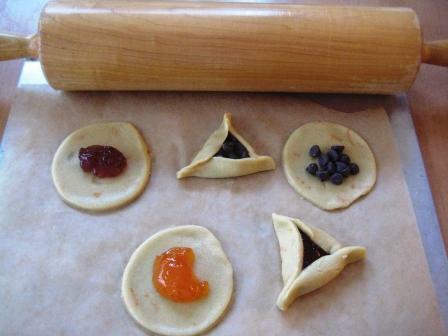 For a short video on how to shape the hamantaschen, see my Noshin’ on Hamantaschen post. On Purim, we eat, drink and be merry. Enjoy!